We see our projects as active engagements with community, as part of a dialogue between what is built, the place where it is situated and the people who live there. Our projects are conceptualized and designed with an awareness of a much larger urban narrative. Last August we announced that we had retained Bjarke Ingels as the design architect for the upcoming King & Spadina project in Toronto. The site offers an exciting opportunity for world-class city building. 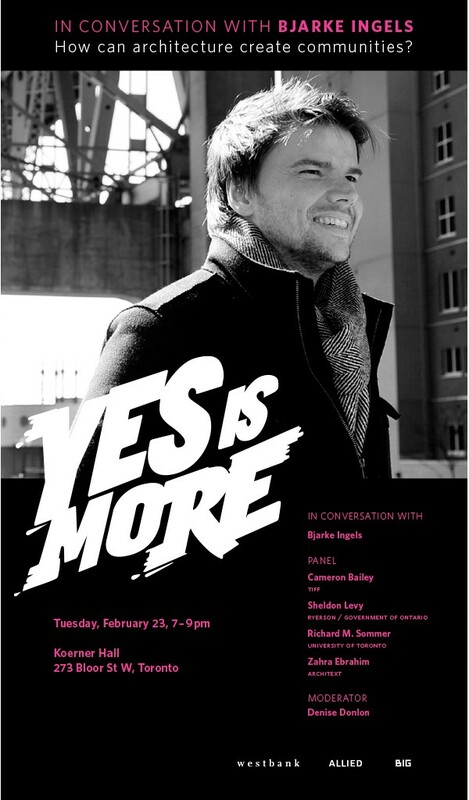 In February we welcome Bjarke Ingels – the design architect for Westbank and ALLIED’s upcoming King Street project – to Toronto for an evening of conversation about how architecture creates communities. This growing desire to play a more active role in city building led us to organize a lecture at Chan Centre with Tadao Ando back in October, 2005. Building upon the success of the success of Ando’s visit we invited Bjarke Ingels to spend an evening with us in Vancouver in April, 2012. Bjarke was an inspiring speaker and the conversation with local artists, architects and designers contributed towards a meaningful dialogue in Vancouver around the desire by many to step out of the constrained architectural language of the last number of decades. Bjarke Ingels addresses local artists, designers and architects about the need to step out of a prevailing orthodoxy of a constrained architectural language.